Once upon a time, in a land faraway called Spain, a girl named Carmenita after her mother, nicknamed Blancanieves by dwarves and branded Snow White by Grimm and Disney was born Pure and destined to be Someone Special in a world of Good and Evil…what girl isn’t? Because of its powerful appeal, Pablo Berger’s Blancanieves — a confabulated fairy tale of a girl coming of age that primarily references Snow White but also Cinderella and Sleeping Beauty — should come with a warning label. Like drugs and tobacco, Berger’s gorgeous black and white cinematography induces a euphoric state of mind that can obscure what the film has to say about the harmful effects that accompany women’s success in our modern world. Blancanieves contains the deadly message that the break women are making with the tradition of passivity in society bodes a bad end of entrapment and exploitation. Unless this film is taken as a warning itself that malevolent forces lay in wait for successful women, it should come with a warning to be viewed at one’s own risk. A fairy tale is not a myth. A fairy tale is not about the deep inner conflicts of the psyche but about the conflicts between a child born and the world into which it’s born. Snow White is born into a world with a poisonous power attitude (embodied by her wicked stepmother) to be surmounted as she moves from child to young woman. A fairy tale is concerned with the familiar and universal theme of a search for the happy ending that overcomes the power of evil in human affairs. Some think of fairy tales as moralistic, but noted Jungian analyst, Marie-Louise Von Franz, asserts there is an ethos in fairy tales that lies beneath the common standards of right and wrong, an ethos that discloses purpose more than moral rightness. Blancanieves achieves purpose in its cinematography, letting a fascinating interplay of black and white images communicate the powerful transcendence of beauty; yet it fails to lift its heroine from the clutches of public exploitation. So that the sadistic stepmother can give her the iconic poisoned apple that symbolically put the fate of Snow White in the heads of girls forever when they wondered why they are hated instead of loved and long for a Prince to come who will jostle their glass coffin and wake them from the boredom of repression. The sadistic stepmother does meet a well-deserved comeuppance – any child would demand that of a fairy tale. And Blancanieves does, as she sleeps, shed a tear. The End of the Fairy Tale. With the clear and incisive form of earlier silent films, Pablo Berger’s Blancanieves transforms one of the oldest, well-known fairy tales of a girl coming of age into an epic conflict between eternal and oppositional divine and demonic forces. From the moment of birth, a threat of death drives the action. No three drops of blood here. A girl child is born amidst the blood of her father’s near-fatal goring by a bull and her mother’s bloody death in childbirth. Innocent child, beautiful mother, powerful father, lethal stepmother, loving grandmother, obedient servants, magical helpers, a small prince charming and a rooster to help the child get from place to place all make for a dramatic tale. And the child bears no anger, accepting threat as part of the way life is. But should we, as watchers? Berger’s drama begins in emptiness. The opening shots scan the empty streets of a city eerily assigned an absence of sound. It reads like a blank slate, waiting for action. A placard with a question steals a trick from past silent movies to hear the unspoken sound of our own voice — “Where is everyone?” The answer comes via a shot of people’s feet walking on a promenade toward Spain’s famous bullfighting ring in Seville. Everyone’s attending the fantastic spectacle in which a great man faces a menacing beast with the bodily moves of a dancer and a cape. The circular arena is packed. Attention is riveted on Antonio Villalta (Daniel Gimenex Cacho), a famous matador who has been dressed with tender care and bows in respect to the crowd. Just before entering the bullring, he kneels before an aloof plaster statue of Madonna, kissing the photo of his beloved wife in a locket and putting their fate in the upturned fingers of her hand. The photo dissolves into his beautiful, pregnant wife, Carmen (Macarena Garcia), already in the stands. Villalta is announced by another placard, “Six bulls, one single toreador”. There follows one triumph after another until the sixth bull. Villalta lifts and points his sword, facing the bull on the verge of his final kill. He creates an irresistible photo-op for a news photographer who’s been banned from taking photos. The photographer sneaks up to the rim of the ring and takes a shot with a blinding florescent flash. Villalta takes his eye off the bull for a deadly second and the bull, aptly named Lucifer, charges. And evil never stops charging in this epic conflict between predator and prey. The weakened, paraplegic Villalta marries his gorgeous but malevolent nurse, Encarna (Maribel Verdu), who eventually kills him. He abandons his infant, mother-look-alike daughter, Carmenita (Sofia Oria) to her devoted but elderly grandmother, Angela Molia (Dona Concha), who dies. That’s how Carmenita comes into the hands of her stepmother. And then, in a cinematic slide of time, Carmenita disappears as girl child and re-emerges as her young woman self, Carmen (Marcarena Garcia), while hanging sheets outdoors (just one of the many tasks of servitude enforced by her domineering stepmother) she steps from punishment into grave danger. After pushing her invalid husband to his death down a flight of stairs, Encarna sends her footman on a mission to kill Carmen. Carmen is rescued from near death of drowning by a ragtag band of dwarf toreadors and begins to develop her talent fighting bulls. In all versions, Snow White incurs her evil stepmother’s murderous wrath when she comes of age, i.e., coming into the empowered sexuality of a young woman that sets her spirit free from parental dominance. What’s different in Blancanieves is that the girl doesn’t rest on her natural beauty but acquires the skill and charisma of a toreador, drawing upon her father’s legacy. However, this modern turn of events in Blancanieves exposes Carmen to danger. When Encarna asks the famous question “who’s the fairest of them all?” she searches for her reflection in a modern mirror. 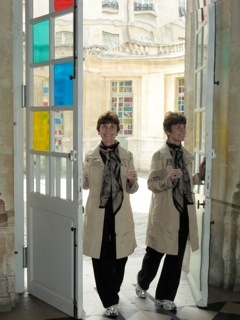 The “mirror, mirror” that doesn’t lie no longer hangs on a wall. It’s not hand held: it’s the press. In the national glamour magazine, Lecturas (think Vanity Fair), Encarna – in all her finery – is buried in the back pages while Blancanieves graces the cover. Thinking Carmen dead, Encarna’s incensed to discover Carmen has not only survived but become a national wonder, a female matador. Beauty represents perfection, the never to be attained but forever to be sought after prize that evil covets. 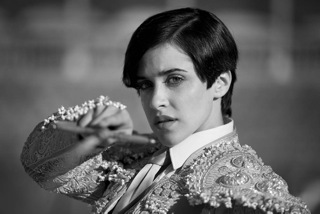 Carmen, having become a public sensation, returns to the grand bullring in Seville. Under cover of a veil of black lace, Encarna arrives, hiding in full view and waiting for the right moment to strike. As Carmen basks in the pleasure of applause after an astounding performance with a treacherous bull, Encarna pulls the poison apple from her purse. Carmen takes two bites from the fated poisoned apple and falls asleep. The wicked stepmother goes to a fate worse than death but we don’t see the gory details as we have with everyone else and what we really want to know is how does the girl destined to be Someone Special fare? To get to the big leagues, Carmen was required to sign a contract with a sleazy agent and now, in her vulnerable state of coma, he exacts his pound of flesh. As the film ends, Carmen has been stripped of her identity as Snow White. The agent hawks her as Sleeping Beauty in a freak show; Carmen is embalmed for life as a passive woman unable to fend off lecherous kisses sold to the perversely curious. Our question begs Berger for a placard but what we get instead is a tear. A single tear sliding down Carmen’s cheek as she lies in her glass coffin behind the curtained freak show is our only clue. We are left, in the end, as all fairy tales leave their listeners, to decide for ourselves what to make of the course of events. Is the tear a response to the devotion of the dwarf who reveres her, loves her spirit and tenderly cares for her passive body? Is the tear symbolic of sadness for the plight of beauty and innocence in the world, an inevitable end for all of us? Is it the water of life coming deep from within her soul foretelling her return to a fulfilling future? I like to think it is the last but this is a dark tale with an icky ending desperately in need of the last fifty years of women on the move to a freedom from dependence on – to borrow a phrase from the great Tennessee Williams that’s relevant to a girl with dwarfs as her only friends — the kindness of strangers. Only if I take Blancanieves as a cracked mirror, a reluctant commentary on a demonic force in society that refuses to free women from a poisonous backlash when they succeed, can I identify a redeeming feature. Otherwise, the beauty of its cinematography feels like a trick, pleasuring while it steals the soul of the purpose fairy tales propose.